Aurora and Finley shared a placenta in utero that needed medical intervention to be corrected. After the surgery, their mama remained on bedrest in the hospital for a few weeks until they were born around 30 weeks. They weighed 2lb 7oz and 2lb 5oz at birth. 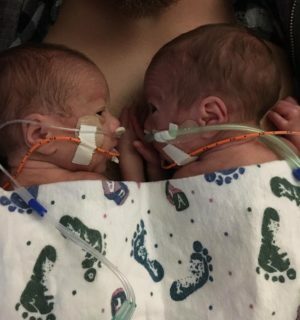 After spending some time in the NICU, mom and dad were so happy to bring these cuties home!